Handwoven from nylon fibers in melon, lilac, and white, this double hammock is crafted by Mexico's Maya Artists of the Yucatan. The artisans present the hammock as part of an effort to preserve the traditional Mayan form of hammock weaving, with a comfortable, lightweight design. 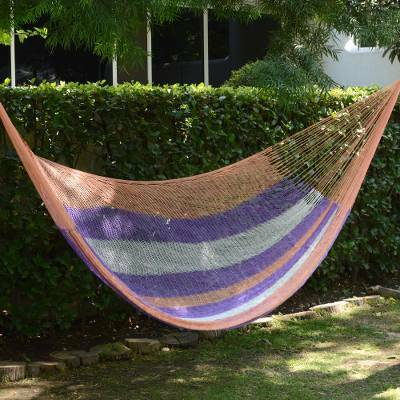 You can find hammock 'Melon Stripe' (double) by Maya Artists of the Yucatan in hammock categories such as Hand Woven Hammock, Nylon Hammock, Rope Hammock and Mayan Hammock. Enjoy exploring these sections for other Novica treasures.